I have always been a fan of older techniques in model railroading. Specifically in regards to outside 3rd rail. It's how Frank Ellison and John Armstrong did it. Who am I to argue with them? The reality is that this is a lost art since model railroading has progressed far from those days. My fascination with it still persists though. I had the opportunity to buy the remnants of an old outside rail layout that existed for nearly 80 years. It was first built around 1930-31 but a gentleman in the Chicago area named Thomas Gear. He called his layout the Gear Lines. After his death in '09, the layout was torn down and sent to auction. The buildings were sold off and nearly all of the track ripped apart and thrown away to a scrap yard. 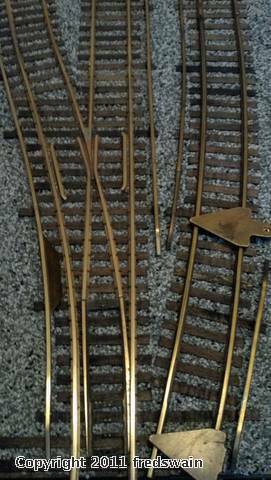 However I was able to acquire a few pieces of rolling stock and a small amount of the original track. Since I have a small amount of it, I thought it would be neat to build a small layout with it so that's what this section will be about. The new Gear Lines isn't being done the same way that Tom did it originally. In fact I'm probably not going to call it the new Gear Lines but I may throw an homage in there somewhere. 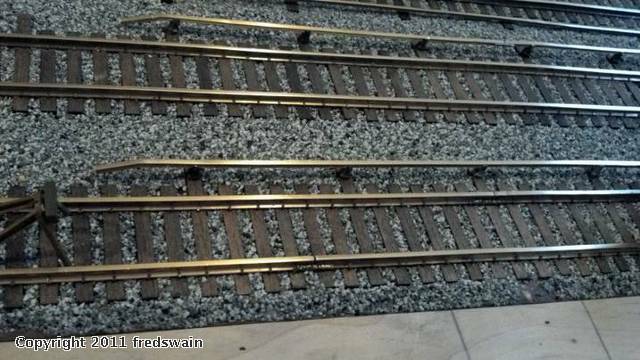 The original track used fiberboard ties that had been nailed down to roofing paper (shingles) that simulated roadbed. It didn't look very realistic. I thought I'd update the look a bit, but not too much. I still want to maintain much of the feel of the old style. I acquired 3 cattle cars, all built from heavy cast aluminum and poorly detailed by modern standards, 2 gondolas made from wood and brass, and 2 brass tank cars. All were hand built and the solder work leaves much to be desired. I will strip these cars down and repaint them. I will also modernize them with 2 rail trucks and Kadee couplers but I am going to stop short of adding prototypical details over what existed originally. Again I want to update yet preserve the original feel of the model era. The cars were all custom letter Gear Lines, and poorly done at that. I will redo them to standard names of cars of the era but they will be vibrant colors like you don't see anymore. Not everything is going to be black or gray. First though comes the track. I need to form a plan...so here it is. Since I have so little of the original salvaged rail, I am limited by what I can build with it. I decided that a small switching layout was appropriate but it would have to be very simple. The standard Inglenook sidings would be about all I could do with it. No problem. I can build it small and light and very easy to move. It wouldn't bind me forever to a large permanent layout but would allow me to build enough to get a taste of what outside rail was all about and what it looked like. I'm fine with that. Since small and portable seemed to be the recipe the next was to work out dimensions and build technique. I decided 1 foot deep by 8 feet long. Small for O scale. The benchwork, if you can call it that, is actually 2 pieces, each 13" deep x 4 feet long. That extra 1" depth was necessary for track spacing. Framing is light, built from select pine 1 X 2's with a 1/2" select pine board on top. It's sturdy yet light. I am not using any cork roadbed or any other form of noise canceling. It was common back then to lay ties straight on the benchwork so that's what I'm doing. Not everyone did this of course but again, you pick a technique and go with it. Trains are going to be moving at a snails pace switching on 3 sidings anyways so overall noise isn't going to be a concern anyways. The ties and tie spacing were chose based on Frank Ellison's technique as described in his book. Ties are 1/8" high x 1/4" wide by 2-1/4" long with 2-3/4" ties for the outside rail chairs and were cut from basswood strips. I was not going to go the fiberboard route. Some people did but others used wood. Some people used roofing paper for their roadbed and some people used sifted rock like we currently do. These ties work out to be too short for scale and too wide for scale but that was what was used back then. It doesn't look half bad though. The ties are spaced as Frank Ellison described. I started by laying the longer outside rail ties first. They are spaced 3-1/2" between them with 5 standard ties in between. My ties are stained with Minwax Dark Walnut. Ballast is Brennan's Better Ballast. The rail is all brass. Not optimal but again I'm reusing 80 year old rail. I can't be picky! The rail required lots of patience to straighten out and clean. It was bent out of shape so bad from the layout destruction that most people would sell it for scrap, and most of it was. I'm patient though. The rail code is a very heavy Code 198. Yes the rail is much taller that scale but the thickness is far greater than even current day code 250. It's very heavy rail. This rail code went extinct at the start of WWII. The outside rail is also brass and was a special shape that allowed it to fit well into the special brass outside rail chairs. I was fortunate enough to also acquire 2 old 3 point track gauges for this rail code. One of the 3 point gauges has the outside rail chair location on it so this worked out perfectly. Anyways...enough of this. Here is the start of the pics. A couple for now of the track but more as I move on. Here is the first of only 3 switches that will be on the layout. 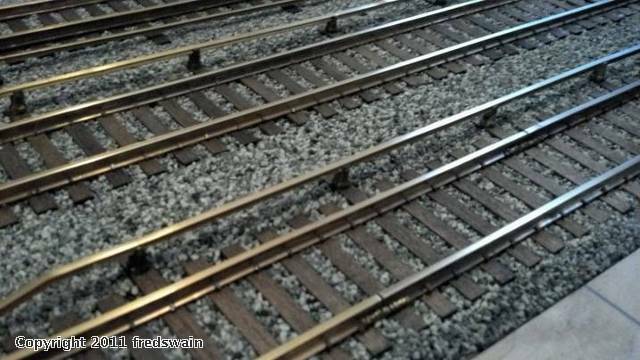 This shot shows the 3 point track gauges as well as the outside rail chair locator on one of the gauges.